Brigadier General Hurst, generally called "Hunter" by his seniors and contemporaries, was Georgia-born and Georgia-bred. While studying at Mercer University in Macon, Georgia, he attended Platoon Leaders Class and was commissioned as a Marine second lieutenant upon graduation in 1938. In the early years of his career, he had both seagoing and shore assignments. Shortly after his promotion to major, he took command of the Marine Training Detachment at Mt. Holyoke College in Massachusetts, where some of the first women to be commissioned as Marine officers were trained. Transferred overseas in April 1944, he joined the 1st Marine Division on Pavuvu, Russell Islands, to assume command of the 3d Battalion, 7th Marines. On Pavuvu, the battalion, like the rest of the division after the Cape Gloucester operation, rehabilitated, refitted, and absorbed new personnel while beginning an accelerated training schedule prior to the landing on Peleliu slated for 15 September 1944. Hurst led his 3/7 ashore on the division's extreme right flank at Orange Beach 3, where it had to cross directly in front of commanding defensive fortifications flanking the beach further to the south. The enemy position's enfilading fire, together with some natural obstructions on the beach, caused one of Hurst's companies to land left of its target and onto the beach of the adjoining battalion. As a result, Major Hurst had to spend considerable time regrouping his battalion, reorienting it towards his assigned line of advance east of Orange 3. The first big obstacle facing Hurst was a concrete enemy blockhouse that naval gunfire had not destroyed. After setting up night defenses, the 7th Marines was plagued with a number of significant attacks from the Japanese battalion opposite its lines. But these were turned back without any problems. After clearing the south of Peleliu, completely destroying the Japanese dug in there, the 7th Marines was ordered to the north of the island to relieve what was left of the 1st Marines, which had experienced perhaps the heaviest fighting of the campaign. For his actions as commander of 3/7 on Peleliu, Maj Hurst was awarded the Silver Star Medal for his personal efforts in reconnoitering the frontlines and directing the battalion in its furious attacks on Japanese fortified caves and blockhouses. In the invasion of Okinawa on L-day, 1 April 1945, the 7th Marines was on the extreme left flank of the 1st Marine Division's zone, with now LtCol Hurst's 3/7 in regimental reserve. Before noon, 3/7 landed and took up a position behind the regiment's other two battalions. After reorganizing, the 1st Marine Division as a whole began its assigned mission of cutting the island in two by reaching the east coast of Okinawa. Against some sporadic and limited enemy resistance in difficult terrain, the east coast was gained by the end of 3 April. Until the 1st Marine Division was committed to the Tenth Army line facing south at the end of the month, 3/7 was busy patrolling in its zone. In the south, the Marines faced a well-dug in enemy determined to fight to the last man. One of the positions that needed to be taken was Wana Ridge. The fighting here on 17-18 May was intense, the 1st Marine Division later recording that "gains were measured by yards won, lost, then won again." For his performance in this fighting, during which he personally directed the assault on a desperately defended crest of the ridge, Lieutenant Colonel Hurst was the recipient of a Navy Cross. On 19 June, Hurst was wounded and evacuated. Following the end of the war, Lieutenant Colonel served in an assortment of staff and command assignments. He was promoted to the rank of brigadier general in 1963 and remained assistant division commander of the 1st Marine Division at Camp Pendleton, California. His final Marine Corps assignment was as director of the Marine Corps Landing Force Development Center at Quantico, Virginia. After his retirement on 1 January 1968, he became Superintendent of the Marine Military Academy in Harlingen, Texas. Following this, he made his home in Alexandria, Virginia. General Hurst died 6 September 1997 and was buried with full military honors in Arlington National Cemetery. Mrs. Edward Hunter Hurst, widow of Brig. 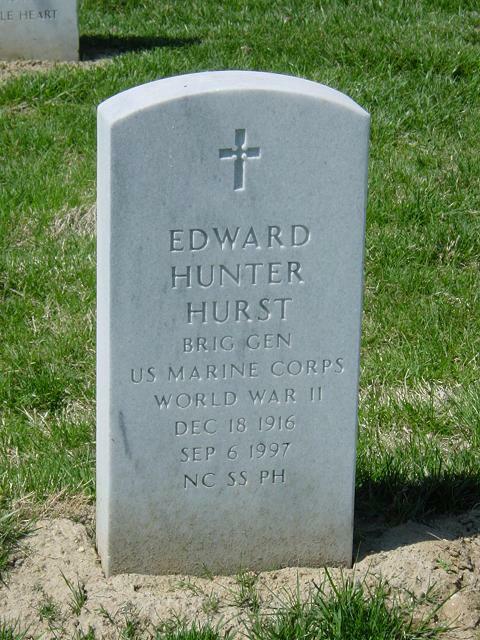 Gen. Edward Hunter Hurst, USMC (Ret. ), died March 9, 2007 in Charleston, South Carolina. a long time resident of Northern Virginia. She was married July 31, 1942 in Pensacola, Florida, to Capt. Edward Hunter Hurst, USMC, of Fort Valley, Georgia. Mrs. Hurst was graduated in 1939 with a Bachelor of Science degree in Mathematics from Florida State College for Women, Tallahassee, Florida, where she was a member of Kappa Delta social sorority and was elected to Phi Kappa Phi and Phi Beta Kappa Scholastic Honor Societies. She taught mathematics in Pensacola, Florida. In 1982 she received a Bachelor of Arts in Art History from George Washington University. Surviving are her daughters Ann Hurst Harrington and husband Myron of Charleston, South Carolina, Perrin Hurst Ireland and husband Tom Ramey of Cambridge, Massachusetts and Elizabeth Hurst Biebighauser and husband Vic of Montgomery, Alabama; her grandchildren, Ann Hunley Harrington, Myron Charles Harrington, III and wife Kathleen, John Hunter Biebighauser and Julia Perrin Biebighauser; and her great-grandchildren Emma Grace Harrington, Lillian Hope Harrington and William Hunter Harrington. She is also survived by her brothers Eugene Perrin Elebas and Clarence Couch Elebash of Pensacola, Florida. She was pre-deceased by her brother Hunley Agee Elebash of Wilmington, North Carolina. Funeral services will be held at the Old Post Chapel, Fort Myer, Arlington, Virginia at 3 p.m. on Thursday, March 29, with burial to follow in Arlington National Cemetery.